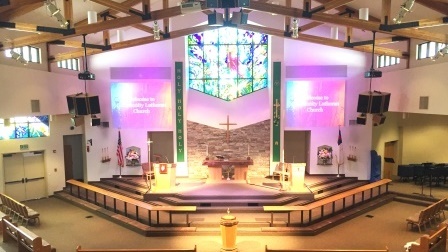 Community Lutheran Church began in Escondido in 1989 and became a multi-site church in 2011 when we chose to expand worship services to San Marcos. By holding services in Escondido and San Marcos, we can reach more people with the Good News of God's love on Sunday mornings! We are not separate churches, just separate worship services of the same church. We share staff, have one church council, one membership, use a common budget, and hold events together. No matter which site of Community Lutheran Church you choose to worship at this Sunday, you will experience a meaningful and uplifting time of prayer and praise. Directions to our Escondido campus from CA-78 E: CA-78 East will turn into Lincoln Ave. Follow Lincoln Ave until it ends and turn right onto El Norte Pkwy. Turn left onto E Valley Pkwy. Turn right onto Lake Wohlford Rd and make immediate right into church parking lot. Our church is located across the street from the Escondido Humane Society and at the base of the Valley Center Grade. Directions to our Escondido campus from I-15 S: Exit El Norte Pkwy. Turn left onto East Valley Pkwy. Turn right onto Lake Wohlford Rd and make immediate right into church parking lot. Our church is located across the street from the Escondido Humane Society and at the base of the Valley Center Grade. Directions to our Escondido campus from I-15 N: Exit E Via Rancho Pkwy. Follow Bear Valley Pkwy to Valley Pkwy and turn right. Turn right onto Lake Wohlford Rd and make immediate right into church parking lot. Our church is located across the street from the Escondido Humane Society and at the base of the Valley Center Grade. Directions to our San Marcos campus from CA-78: Take the Twin Oaks Valley Rd exit and head north on N Twin Oaks Valley Rd. Turn right on E San Marcos Blvd and right on Rancheros Dr. Turn left into the business park where you see ABC Vet Clinic and park at the next building.